Welcome to Ambar Systems Ltd.
Ambar Systems Ltd are specialists in electronic access control solutions and Northern Ireland partners for Salto products. Being based in the middle of Northern Ireland means we are ideally positioned to provide the best level of service possible to all our customers. 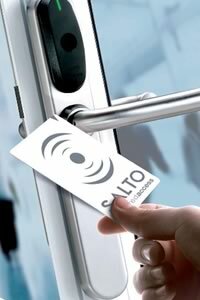 In the world of intelligent locking solutions few products can match the highly advanced SALTO range which provides security, flexibility and control. Their investment in Research, Development and Innovation has enabled them to stay at the cutting edge of modern mechanical, electronic and software design. New legislation, improvements in working practices, ever increasing awareness of staff and public safety means secure and convenient access has never been so important - so it too has to continually change and evolve to keep pace. As a result buildings and workspaces need to be more flexible and adaptable, ready to incorporate new technologies using stand alone door units with real time on-line systems that are inspiring to use, simple to install and able to work with existing IT infrastructure. The Company is currently implementing an integrated quality system (ISO 9001 and ISO 14001) to ensure precise management of all our processes and achieve the highest possible standards of quality for our customers.